Researchers optogenetically create artificial link between unrelated memories. The ability to learn associations between events is critical for survival, but it has not been clear how different pieces of information stored in memory may be linked together by populations of neurons. 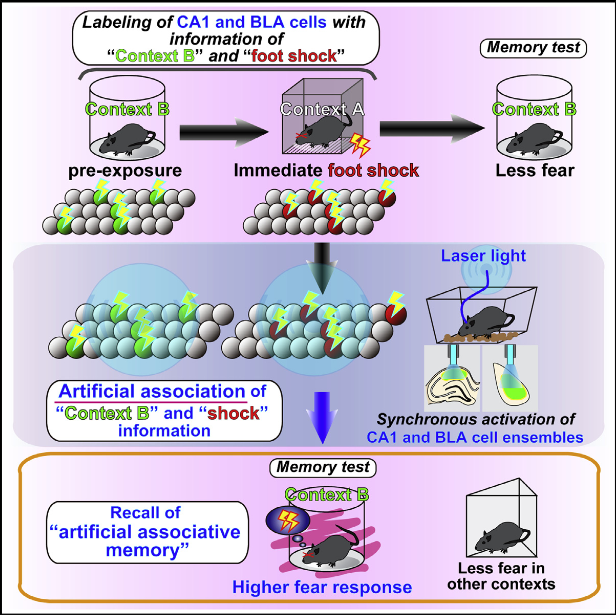 In an opensource study published in Cell Reports, synchronous activation of distinct neuronal ensembles caused mice to artificially associate the memory of a foot shock with the unrelated memory of exploring a safe environment, triggering an increase in fear-related behaviour when the mice were re-exposed to the non-threatening environment. The findings from the University of Toyama suggest that co-activated cell ensembles become wired together to link two distinct memories that were previously stored independently in the brain. The team explain that memory is the basis of all higher brain functions, including consciousness, and it also plays an important role in psychiatric diseases such as post-traumatic stress disorder. By showing how the brain associates different types of information to generate a qualitatively new memory that leads to enduring changes in behaviour, the data findings could have important implications for the treatment of these debilitating conditions. Previous studies have shown that subpopulations of neurons activated during learning are reactivated during subsequent memory retrieval, and reactivation of a cell ensemble triggers the retrieval of the corresponding memory. Moreover, artificial reactivation of a specific neuronal ensemble corresponding to a pre-stored memory can modify the acquisition of a new memory, thereby generating false or synthetic memories. However, these studies employed a combination of sensory input and artificial stimulation of cell ensembles. Until now, researchers had not linked two distinct memories using completely artificial means. The current study used a fear-learning paradigm in mice followed by a technique called optogenetics, which involves genetically modifying specific populations of neurons to express light-sensitive proteins that control neuronal excitability, and then delivering blue light through an optic fiber to activate those cells. In the behavioural paradigm, one group of mice spent six minutes in a cylindrical enclosure while another group explored a cube-shaped enclosure, and 30 minutes later, both groups of mice were placed in the cube-shaped enclosure, where a foot shock was immediately delivered. Two days later, mice that were re-exposed to the cube-shaped enclosure spent more time frozen in fear than mice that were placed back in the cylindrical enclosure. The data findings show that synchronous activation of distinct cell ensembles can generate artificial links between unrelated pieces of information stored in memory, resulting in long-lasting changes in behaviour. By modifying this technique, the team will next attempt to artificially dissociate memories that are physiologically connected. The team surmise that this may contribute to the development of new treatments for psychiatric disorders such as post-traumatic stress disorder, whose main symptoms arise from unnecessary associations between unrelated memories. Memory is thought to be stored in the brain as an ensemble of cells activated during learning. Although optical stimulation of a cell ensemble triggers the retrieval of the corresponding memory, it is unclear how the association of information occurs at the cell ensemble level. Using optogenetic stimulation without any sensory input in mice, we found that an artificial association between stored, non-related contextual, and fear information was generated through the synchronous activation of distinct cell ensembles corresponding to the stored information. This artificial association shared characteristics with physiologically associated memories, such as N-methyl-D-aspartate receptor activity and protein synthesis dependence. These findings suggest that the association of information is achieved through the synchronous activity of distinct cell ensembles. This mechanism may underlie memory updating by incorporating novel information into pre-existing networks to form qualitatively new memories. Artificial Association of Pre-stored Information to Generate a Qualitatively New Memory. Inokuchi et al 2015.